1. Kasturi Bai, 58, an old Hindu woman, has not applied oil to her hair for the last ten days. The entire family is in a state of mourning as the 120-year-old tazia is taken out from her house. The house is kept especially clean, the pan is not chewed, nothing new is worn and everybody walks barefoot. When asked if anybody in her family has objected to this practice she says, "How dare anyone?". Amongst those designing the tazia is a police man who is on leave these days to oversee the preparations here. 2. A Muslim police officer, who considers tazia and 'maatam' as absolutely un-Islamic and is dead against them, stops a 'sawari'. The cop scolds him. "Don't you have an iota of shame, doing such bid'at despite being a Muslim'. The 'sawari' sheepishly says...'Sahab, main Hindu hoon' (Sir, I am a Hindu) leaving the cop astonished. 3. Through out India eunuchs [the hijdas] take out the most opulent tazias. 4. Amaria Bai, a Hindu, came 150 km from her native village to the state capital to her son just to watch Muharram. Can you believe this? Undoubtedly Muharram is the most Indianised of all Islamic observances. It was soon after partition when Delhi was witnessing a shaam-e-ghariban as lakhs of Muslims had left for Pakistan that the government decided to take out the government's tazias in keeping with the tradition. Similar sarkari tazias that were taken out by former Hindu states like Holkar, Scindia in Central Indian region, continue to this day. At several places district collectors or other government officials are guardians of the tazias. For several years these tazias were taken out as hardly a few thousands of Muslims were left in Delhi. Muharram regained its fervour in Delhi by eighties. 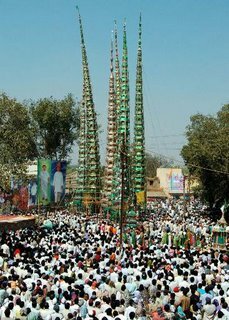 From Muharram in Delhi and Lucknow, where for 17 years ban remained on processions, to the tribal belt of Bastar and in the South, Muharram bears the shades of local culture. I never saw savaris in UP. So are the 'sher', children painted as tigers who wander on the streets in Eastern Maharashtra and Chhattisgarh during the entire ten days. This makes Muharram, Yaum-e-Ashura, an all encompassing tradition. What a great tradition it is. Most of my friends oppose all these practises as un-Islamic. 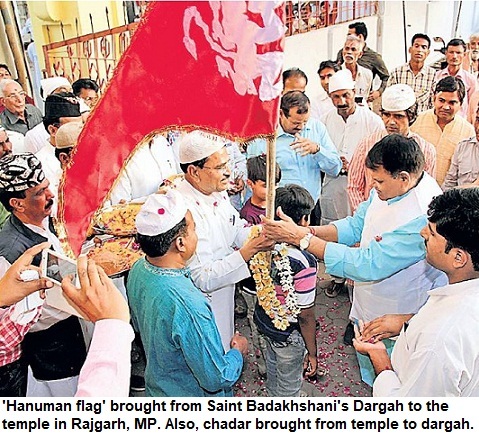 But sine my childhood I have been fascinated with the way Moharram brings all Indians together. I never feel that I have any right to make any such pronouncements about bidah etc. Artisans across all fields were in form or the other associated with tazia-making. I remember my Badhai (carpenter), who left all work to return to his hometown to make tazia in the mohalla, though he was otherwise a staunch Hindu. The blacksmith makes knives and arms for the 'akhada'. Similarly the intricate handwork on the tazias required artisans from all classes and linked them economically to the Muslims. Lately we heard that old tradition of Muharram was dying in India. See photos of the unique Muharram processions in India that show tigers and other interesting facets. See posts here and here.